"Find it, use it, cite it"
Citing a dataset correctly is just as important as citing articles, books, images and websites - each dataset is a source of evidence to support your argument. We provide citations for every record and dataset version held in our Data Catalogue. Simply use the UK Data Service citation tool to copy and paste the correct citation (available in multiple formats) into any reference list. For a quick overview, see our top ten tips to citing data. Any publication, whether printed, electronic or broadcast, based wholly or in part on the data collections accessed through the UK Data Service must be accompanied by the correct citation and acknowledgement information. ESRC award holders are expected to cite their data to encourage and facilitate data sharing under the terms of the ESRC Research Data Policy. Depositing data with the UK Data Service means the data is assigned a DOI. Using DOIs helps us all to follow the 'FAIR' Guiding Principles for scientific data management and stewardship – Findability, Accessibility, Interoperability and Reusability. 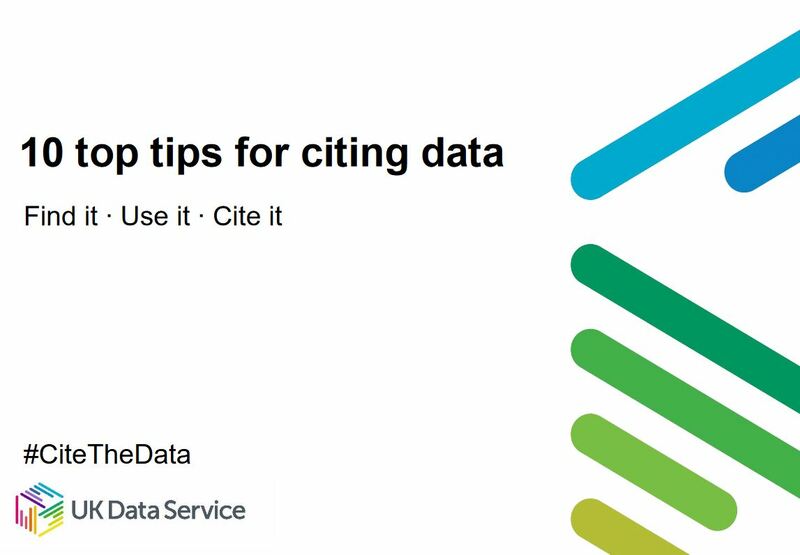 View our video tutorial on how to cite data obtained from the UK Data Service, including some of the methods we’ve used to try and make data citation and referencing as easy as possible for researchers. For more information about the importance of data citation and the role of DOIs, see the ESRC data citation webpage and brochure Data Citation: what you need to know. Read our blog Spotlight on #CiteTheData: Make the data count which discusses citation and the benefits it brings to researchers and research. ICPSR video Why should I cite data?